A file photo shows a person picking up romaine lettuce. The FDA has revised its warning about romaine lettuce linked to an E. coli outbreak, eliminating three California counties from the list of possible origins of the contamination. The U.S. Food & Drug Administration also said it found at least one specific source linked to the outbreak at a farm in Santa Barbara County. In a new advisory issued Thursday, the FDA said there is no longer a reason for consumers to avoid lettuce from Ventura, San Luis Obispo, and Santa Cruz counties. Still on the list of counties to be avoided are Santa Barbara, San Benito, and Monterey counties. All six counties had earlier been identified as potential sources of contaminated lettuce. The FDA said further investigation has allowed them to narrow the list. 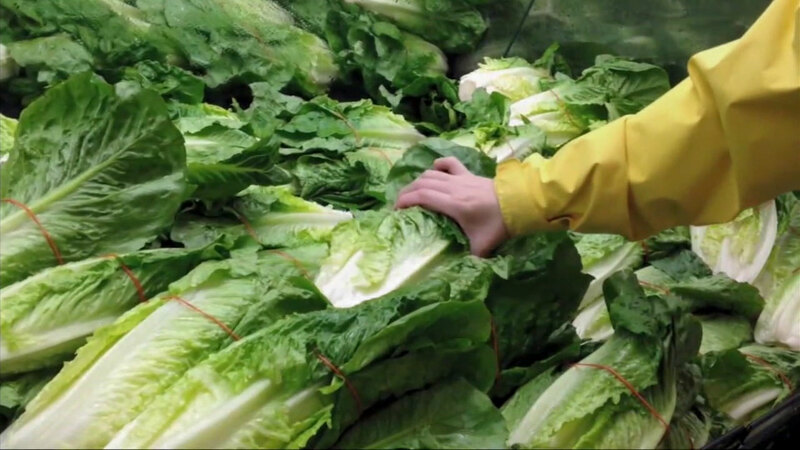 The FDA says the tainted lettuce that caused a recent E. coli outbreak came from California's Central Coast and produce harvested in other areas is safe to eat. Investigators have also traced the E. coli outbreak to at least one specific farm in Santa Barbara County, though they caution there may be others. The farm was identified as Adam Bros. Farms. The FDA said the farm is cooperating with the investigation and has not shipped any lettuce since November 20. The company is also recalling possibly contaminated products and working on steps to prevent future problems. During the outbreak in October and November, 59 people were reported with illness from E. coli, including 23 who were hospitalized with kidney failure. No deaths have been reported.